A central location modern cabin-style decor free Wi-Fi and an outdoor pool make the non-smoking 3 Peaks Resort and Beach Club a favorite of our guests visiting South Lake Tahoe. 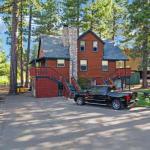 The pet-friendly 3 Peaks is a good fit for families and groups offering 56 accommodations in two-story buildings scattered throughout a pleasant wooded property. All rooms have a classic cabin-style feel combined with modern furnishings and electronics including free Wi-Fi. One- or two-bedroom suites have full kitchens (stove oven refrigerator microwave utensils) separate living areas with sofa bed TVs with DVD player and fireplaces; some have jetted tubs and private balconies. Guests enjoy the two-level outdoor pool and hot tub area (seasonal) or a quick walk to a private beach (passes available at the hotel). The 3 Peaks Resort is within a few blocks walk of the lakeshore and Heavenly Village which offers shopping dining movies and the gondola to skiing at Heavenly Mountain. Stateline casinos are an easy two-minute drive. Reno-Tahoe International Airport is 57 miles from the resort.